Spray 13x9-inch pan with nonstick cooking spray. In medium saucepan, combine brown sugar, syrup and margarine. Bring to a boil over medium heat, stirring constantly. Boil 1 minute. Pour syrup mixture evenly in bottom of sprayed pan. Arrange bread slices in even layer over syrup mixture. Set aside. In large bowl, combine eggs, milk, vanilla and salt; beat with wire whisk until smooth. Pour evenly over bread in pan. Cover; refrigerate at least 8 hours or overnight. To bake, heat oven to 350°F. Uncover pan; bake 30 to 35 minutes or until lightly browned. 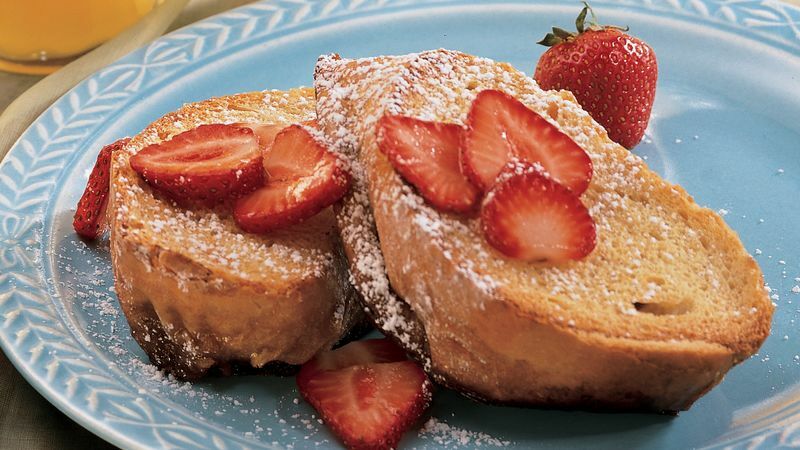 To serve, top each serving with 1/4 cup sliced strawberries; sprinkle with powdered sugar.